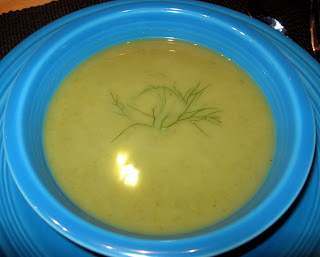 Tang is introduced to this light and delicious winter soup by adding a dollop of Greek yogurt. Sautee onions, garlic and fennel in a bit of olive oil for a few minutes. Add the chicken broth and bring to a boil. Reduce heat and simmer, covered, until fennel is tender. Puree until smooth and pass through a fine seive. Place a spoonful of plain, Greek yogurt in the center of each bowl and serve. This hearty dish combines land and sea. Sautee the garlic, jalapeno, sundried tomatoes and sausage over medium heat for about 5 minutes. Add the shrimp, scallops and lemon juice, cover and sautee until done, just a few minutes. 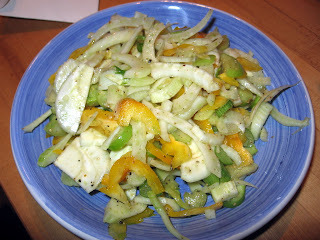 A great way to end a hearty meal is with a fresh salad of seasonal fruits. Because we joined the CSA, we are still getting farm-fresh strawberries in October. 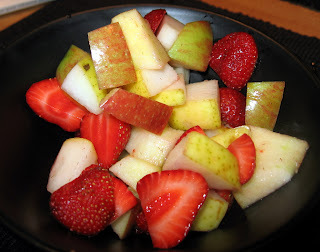 For this salad we used strawberries, Braeburn apples, and Bartlett pears. We spritzed a bit of lemon juice on just so that the fruit would not oxidize. 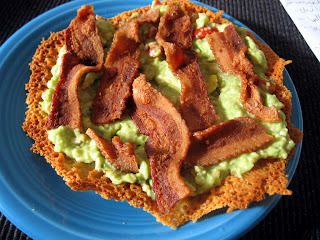 The acidity of the salad pairs well with the richness of the bacon and eggs. Also, the salad was leftover from the other night, so this was a great way to use op the leftovers without feeling like we were eating leftovers. Heat the bacon pieces and onion in a pan over medium high heat, stirring frequently. When everything is crispy and the fat has rendered, drain the bacon and onions and put back in pan. Reduce heat to low and add in the slightly beaten eggs. When eggs are almost cooked through, sprinkle the cheese and stir the eggs until done. 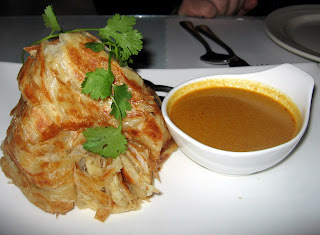 This time we walked in the door and they asked us how many roti prata we wanted. I suppose that they've noticed we are obsessed. In any case, this is a snack worthy of obsession. It's flaky and stretchy and buttery and very, very good, especially after you have a few drinks in your stomach. This is Giao's awesome, spicy, all-meat, no-beans chili. It's very low in carbs and it is great for lunch or dinner. Also, since it gets better with age, it's great to eat for lunch at work. 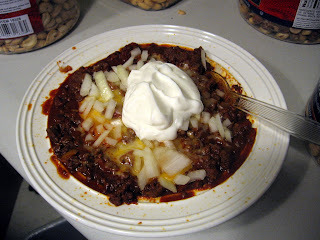 We finish it off with some grated cheese, fresh, diced onions and a dollop of sour cream or plain Greek yogurt. We also make it in large batches sometimes and freeze it. Brown the beef and the onions in a very large pot. Drain the fat and return the meat and onions to the pot. Add the tomatos, the boullion dissolved in the water and the bell pepper. Stir to combine. Add all of the spices, mix thoroughly and bring the mixture to a boil. Reduce the heat to very low and simmer for a few hours, stirring every so often, until the chili is thick and not watery. 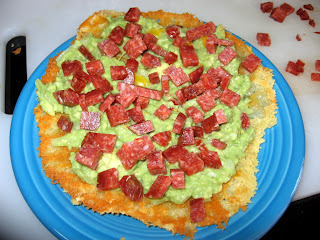 Serve with sour cream (or Fage yogurt), diced red onion and grated cheese. This salad is refreshing and hearty at the same time. The tomatillos add a touch of sweetness and acidity to the mix. Combine the olive oil, vinegar, grainy mustard and Splenda to make a vinegarette. Toss the veggies in the vinegarette and serve. A friend of ours' company moved to the city and he now works sort of near us. Giao met him for lunch at a central location which happens to be one of the best lunch spots around. Delicious food and the best prices around. This enormous bowl of soup is the best version of any Vietnamese place in SF. It's a tad gelatinous without being off-putting and the flavor is great. We also like that they use white asparagus instead of green, as it is less bitter. Giao ate lunch with E. at Unicorn, a new "pan-asian fusion" place that opened up in the location of defunct Thai steam-table place. It wasn't very good. Too sweet and not enough oxtail. Fish is great for weekdays because even if you forget to thaw it ahead of time it only take about 1/2 an hour to thaw it in a sink full of water. The beet greens were leftover from the beets we made on Sunday. 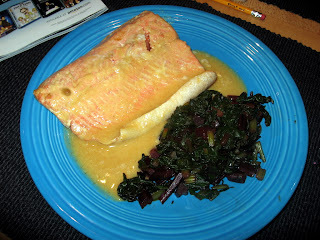 The beet greens were simply chopped and sauteed in a bit of olive oil until tender. In a small sauce pan, heat all ingredients except for the salmon over low heat until simmering and thoroughly combined. Place the salmon in the center of a large piece of aluminum foil on a cookie sheet. Pour the sauce over the salmon. Enclose the salmon in the foil and bake on 350 for 15 minutes. While we were waiting for a table at Palace BBQ several weeks ago, we decided to hit the Korean grocery store next. Among other things, we bought a bag of frozen, cleaned, baby octopus. They've been sitting in our freezer since we bought them because Alexis wasn't really sure what to do with them. 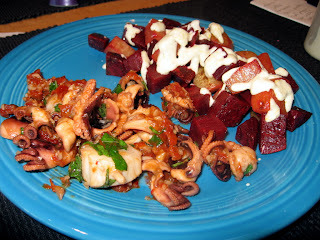 To day she had a little inspiration and chefed up a very tasty, Basque/Italian style octopus dish with a tasty side of beets. Halve the octopus and marinate in the lemon juice, olive oil, garlic and cayenne for about hald an hour. Dump the octopus and marinade into a hot pan and sautee until the octopus firms up (just a couple minutes. 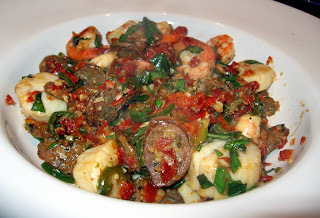 Add the sun dried tomatoes and the scallops and cover for 1 minute. Uncover and sautee until scallops are just done. Add the chopped fresh basil, stir and serve. Mix mayo, horseradish and lemon zest and set aside. Boil the beet pieces until fork tender. Drain and sautee in a bit of olive oil for a few minutes, until edges start to crisp. Put a portion of beets on each plate and spoon some mayo sauce over the top. As we surveyed the food court at MDW, we were resigned as usual to over-pay for our morning repast. We considered finishing up our Chicago Food Trifecta with the Italian Beef, or another hideous rendition of the bagel breakfast sandwich when we ran across Illinois Bar and Grill tucked into the corner of the food court. Unlike it's neighbors, which are your standard counter walk up, it has actual walls which house 3 booths and a bar. The most surprising part was that it offers up the same menu as its out of airport location, without your standard airport markup. 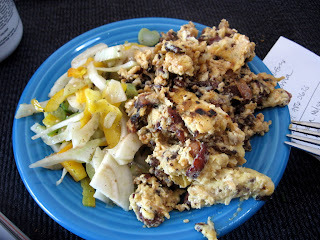 A 5 egg omelet for $6! 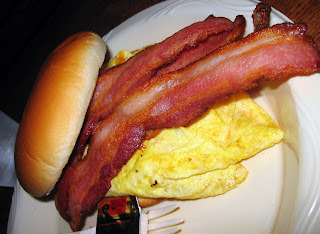 A breakfast sandwich for $3! We both ended up ordering the breakfast sandwich, adding cheese and a generous portion of bacon. We mistakenly ordered the sandwich on a "bun", which we thought was going to be a toasted roll, but which was, in fact, a regular hamburger bun. However, this enormous sandwich was filling and was certainly a good deal.